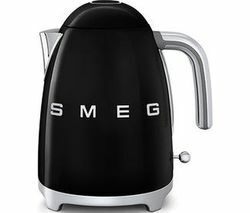 With its instantly recognisable designs, Smeg has been transforming British kitchens for over 20 years. 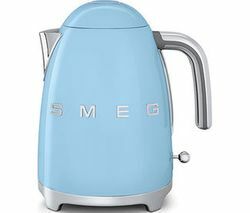 The Smeg kettle range doesn’t disappoint, offering up bold colours, futuristic functionality and a truly contemporary look for the home of today. 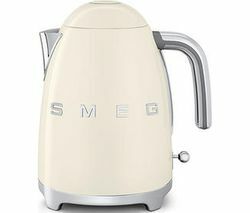 The Smeg kettle range gives you a choice of thoughtfully-designed 50s-inspired jug kettles to choose from. Featuring easy-pour spouts, heatproof handles and anti-slip feet, they’re as practical as they are striking. With an extensive colour scheme, from the pink KLF01PKUK jug kettle to the green KLF01PGUK , they’re designed to perfectly match other items in the retro Smeg kitchen appliance range. 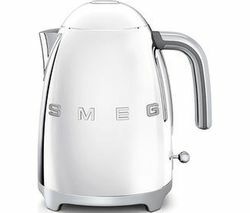 Made from solid stainless steel, all Smeg kettles have a handy 1.7 litre capacity, and a 360° rotational base that makes it easy to use anywhere in the kitchen, whether you’re right or left handed, without a pesky cord getting in the way. Anti-slip feet and auto shut-off at 100° ensures safety in the kitchen. Fitted with removable stainless steel anti-limescale filters and concealed heating elements, they’re also easy to clean and maintain. If you’re looking for something a little stylish and different, the Smeg Kettle range is guaranteed to brighten up your kitchen instantly. Check out the range from other iconic kettle brands such as Delonghi , Dualit and many more.